HALIFAX, NOVA SCOTIA--(Marketwired - Oct. 4, 2016) - Erdene Resource Development Corp. (TSX:ERD) ("Erdene" or "Company") is pleased to announce results from the first seven holes of its originally planned 5,000 metre drill program at its 100%-owned, high-grade Bayan Khundii gold project ("Bayan Khundii") in southwest Mongolia. In addition, the Company announces an expanded drill program with a total of 9,000 metres now anticipated to be completed in Q3-Q4 at Bayan Khundii and at the Company's neighboring, 100%-owned Altan Nar and Altan Arrow gold projects. Included with this release, for reference, are two plan maps and a cross-section showing project locations, the position of today's drill holes, as well as areas where drill results are pending. "Bayan Khundii continues to deliver exceptional, near-surface gold grades over wide intervals and today's results increase our confidence in the continuity of these gold zones and the broad extent of the lower-grade mineralization," said Peter Akerley, Erdene's President and CEO. "As the drill program advances we will be testing multiple targets outside of the known mineralized area, predominantly under younger cover rocks, to better establish the size potential of the Bayan Khundii gold system." HONG KONG, October 4 – SouthGobi Resources Ltd. (TSX: SGQ, HK: 1878) (the "Company") announces the voting results of the annual meeting of the shareholders (the "Meeting") held in Vancouver, Canada on September 30, 2016. Appointment of Auditors - PricewaterhouseCoopers LLP was appointed as auditors of the Company to hold office for the ensuing year or until their successors are appointed. The resolution was passed by a majority of the votes cast by a show of hands. Fixing the Number of Directors - The number of Directors of the Company (the "Directors") to be elected at the Meeting for the ensuing year was fixed at eight. The ordinary resolution was passed by a majority of the votes cast by a show of hands. Re-Election of Directors – The eight Directors set forth in the Company's management proxy circular dated August 16, 2016, were re-elected as Directors to hold office for the ensuing year or until their successors are elected or appointed. 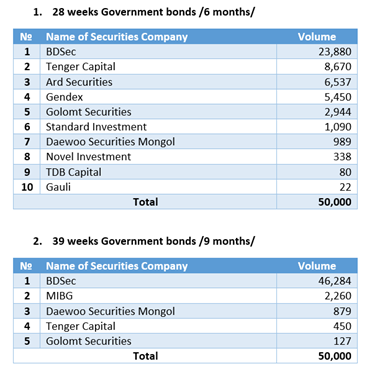 October 4 (MSE) On 04 October 2016, 28 weeks Government bonds /16.883% annual coupon rate/ worth MNT5.0 billion, 39 weeks Government bonds /16.958% annual coupon rate/ worth MNT5.0 billion traded respectively at Mongolian Stock Exchange. 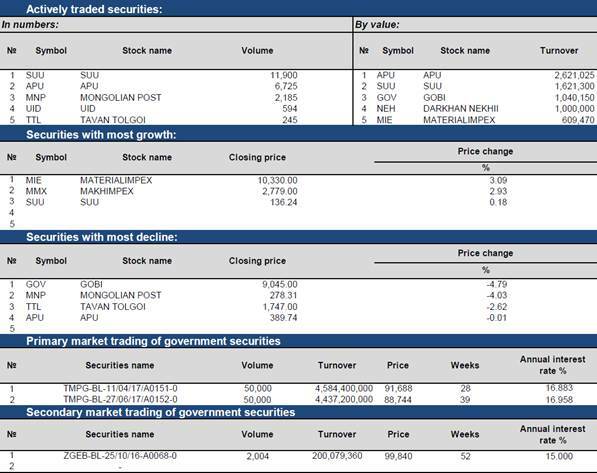 October 4 (Bank of Mongolia) Spot trade: Commercial banks bid MNT 2282.50-2293.10 for USD4.7 million and MNT 342.05-342.55 for CNY4.0 million respectively. The BoM did not accept any bid offers. 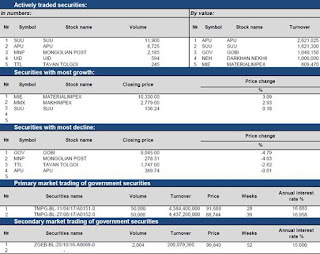 Swap and forward trade: The BoM received bid offers of USD8.0 million of MNT swap agreements from commercial banks and the BoM did not accept any bid offers. 3) The Minister of Finance B.Choijilsuren states "TT project will go forward", but how? Harvesting of the 2016 main season cereal crops, mainly wheat, barley and oats, is completed. The 2016 wheat production is estimated by FAO at 450 000 tonnes, up almost 80 percent from the 2015 sharply‑reduced level and close to the 2014 record. This is the result of a recovery in both plantings and yields, reflecting favourable weather conditions and Government support, including distribution of subsidized fuel, wheat seeds, pesticides, herbicides and fertilizers. Wheat and rice are the two major imported cereals, mainly from the Russian Federation and Kazakhstan. Cereal imports in the 2015/16 marketing year (October/September) are estimated to almost triple the previous year's low level and reach 199 800 tonnes. This mainly reflects higher wheat imports, which are forecast at 170 000 tonnes, four times more than last year's level and well above the five‑year average, reflecting the sharply reduced harvest in 2015. Rice imports in 2016 are anticipated to remain close to the previous year's level at 24 000 tonnes. 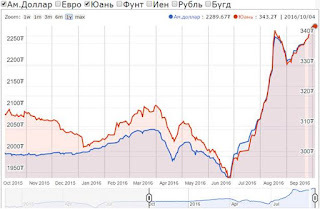 Prices of beef and mutton meat in Ulaanbaatar have decreased seasonally since June 2016, reflecting good supplies in the market. 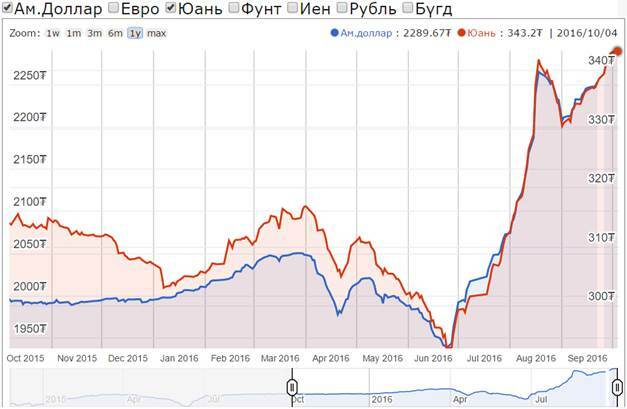 Overall, prices were below their levels in 2015. Wheat flour and rice prices in Ulaanbaatar remained relatively stable in recent months, owing to adequate availabilities mainly from increased imports. Ulaanbaatar, October 4 (MONTSAME) An export credit agreement was signed for the "Ulaanbaatar Trenchless sewer line repair" project on September 27 in Vienna. The credit EUR 7.0 million is provided under the financial cooperation agreement between the governments of Mongolia and Austria, established in 2011. With the export credit, the trenchless repair technology will be introduced to Ulaanbaatar's underground water supply system and 44 km long sewer lines will be repaired without excavation. The project executors are the Austria-based RTI Austria Company and the UB Mayor's Office. Ulaanbaatar, October 4 (MONTSAME) The Deputy Mayor of Ulaanbaatar responsible for green development and air pollution J.Batbayasgalan received October 4 Director of Germany-based Olsberg Company Ralf Kersting. Olsberg has some 400 years of experience in manufacturing furnaces and heating equipment. Mr Kersting made an introduction to one of the company's newest products – a heating equipment suited for the weather conditions of Mongolia and for Ger (nomad's dwelling). The equipment accumulates heat during nighttime, when the heating tariff can be discounted, and releases or keeps the heat for 24 hours. This can be a great contribution to reducing Ulaanbaatar's air pollution, which is a pressing problem facing Mongolia's biggest urban center. However, the nighttime tariff of electric power must be reduced, says Mr Kersting. Deputy Mayor J.Batbayasgalan said the UB City governance is making efforts in creating proper legal grounds for reducing air pollution and introducing latest technologies. The sides arranged a meeting to elaborate the details of the proposal. October 4 (UB Post) Air pollution is a major cause of disease and death, and that is especially the case in developing countries such as Mongolia. Ulaanbaatar's air pollution is putting lives at risk –especially leaving younger, older, and poorer people at higher risk of developing serious health problems. In the last few years, smog and ash have increasingly blotted out the blue sky in Mongolia's capital. Ulaanbaatar is among the most polluted cities in the world, and the health risks in the capital during winter are increasing rapidly. When the quality of air declines, the risks of stroke, heart disease, lung cancer, and chronic and acute respiratory diseases like asthma increase drastically. Every winter the living conditions in Ulaanbaatar get worse. City residents report problems with breathing during winter, and about the toxic smell outside. They also cite limited visibility in traffic, leaving more room for accidents. Ulaanbaatar is the coldest capital city in the world, and more than half the city's population lives in the ger districts, in either brick housing or traditional gers. As the cold temperatures during winter are almost unbearable, residents burn cheap coal, plastic, and rubber to heat their gers and houses. This is one of the main causes for the horrendous air quality in UB. 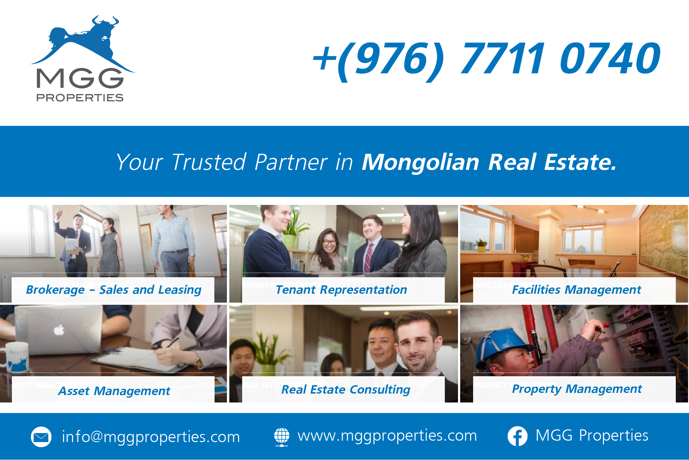 The city's pollution levels rose along with the mining boom in 2000 which made Mongolia one of the fastest-growing economies in the world. People moved their gers and families to the fast-growing capital, in search of better opportunities. With about 60 percent of residents living without central heating in the ger district, pollution levels escalated quickly. While all regions of the world are affected by pollution, populations in low-income cities, such as Ulaanbaatar, are the most negatively impacted. According to the World Health Organization (WHO), 98 percent of cities in low and middle income countries with more than 100,000 inhabitants do not meet WHO air quality guidelines. According to WHO, some three million deaths a year are linked to exposure to outdoor air pollution. However, indoor air pollution can be just as deadly as the air pollution outside. In 2012, about 6.5 million deaths (11.6 percent of all global deaths) were associated with a combination of indoor and outdoor air pollution. Nearly 90 percent of air pollution-related deaths occur in low and middle-income countries, with nearly two out of three occurring in Southeast Asia and the Western Pacific regions, according to the World Health Organization. Pollution affects people in several ways. In UB today, the risks of miscarriage and birth defects are ten times higher than what was reported three years ago. Mothers worry about losing their unborn children, and they fear the harm pollution can cause to their young ones. Each winter, roughly half of the city's population is exposed to truly terrifying levels of ambient particulate matter, which affects their health. It is believed that as many as one in every five deaths in Ulaanbaatar may be caused by air pollution, says Ryan Allen of Simon Fraser University in Canada. Ulaanbaatar's pollutant levels of PM 2.5 are six to seven times higher than the WHO's most lenient air quality guidelines for developing countries. These particulates penetrate our gas exchange regions and cause a lot of harm to our bodies. These particles can also lead to eye, nose, throat, and lung irritation, with symptoms of coughing and runny noses. The long-term effects of these particulates are far more serious. There are, however, several options that can make life easier and stop the air quality from getting even worse in Mongolia. A normal ger and poorly insulated houses use 10 times more energy than well insulated houses. 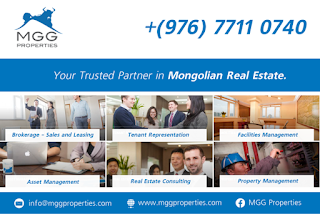 Over 90 percent of all buildings in Mongolia are poorly insulated, and are therefore not well-suited for cold climates. A house built today will last about 40 years, and poor insulation will dramatically increase a household's energy consumption during this time, says Helge Karlsen, founder and CEO of solar energy system company Javiel AS. Most ger district residents use coal in order to heat up their homes, which is one of the main causes for the terrible air quality in the capital. The heavy smog in the city blocks 21 percent of the sunlight during winter, making it hard to use solar energy in the city. Coal is extremely cheap, and therefore the best option for low income families, but high taxes will be imposed on coal in the near future in order to reach the goals set by the 2015 Paris Agreement on Climate Change. It is, therefore, important that Mongolians find new energy sources. "It is important to develop quality products at a price that a normal family can afford, as well as technology that fits in with the Mongolian lifestyle and climate," says Karlsen. This is one reason why he believes there can be a good future for thermic solar panels in Mongolia. These panels produce heat and can reduce coal consumption by 33 percent. By using these panels, it is also possible to reduce 1.2 million tons of CO2 per year, Karlsen claims. The Norwegian has been living in Mongolia on and off over the past five years, and he works hard to improve the quality of life in the capital through renewable energy. His thermic solar panels are currently being tested out in a "normal" Mongolian home in Erdenet. His panels have been tested and documented since 2012 with continuous data logging, and Karlsen says they have proven to be very effective. About one billion of the world's population lives in what we refer to as "cold zones". All these people, as well as our environment, could benefit from using thermic solar panels, argues Karlsen. These panels work best in cold climates, meaning they are perfect for Mongolia. Thermic solar panels could be produced in Mongolia, generating more jobs and income for the country. The panels could be exported to other cold places, such as those in Russia and China, and would contribute to the Mongolian economy. Outside the capital and far away from the pollution, solar energy is a great option. The normal placement of gers is perfectly equipped for maximizing the production of solar energy. The doors of gers traditionally face south, and Karlsen says this is perfect for renewable energy and one of his latest inventions. Karlsen has replaced the traditional wood door of a ger with a thermic solar panel for his new "Hi-Tech Ger". The door will function like a normal door, but will also produce heat through solar energy. He has also installed special heat reflective material in the walls and on the floor of his ger. About 95 percent of the radiant heat energy within the ger is retained. This easy-to-use technology is effortless to install, as well as trouble-free to move whenever the family decides to relocate their ger. This shows that there are many easy solutions that can be implemented by both the government and the residents of Ulaanbaatar to prevent air pollution from getting worse. The most important element is awareness and cooperation. "Everything starts with a change in attitude, and Mongolia has a long way to go compared with other countries," says Karlsen. "Most of the precautions that have been put in place so far in regard to the environment in Mongolia have failed. Things need to be changed based on documented and scientific research and methods," he says. "Ultimately, without improvements, the capital may need to be moved or a new one needs to be built due to the horrific air pollution," argues Karlsen. October 4 (Mongolian Economy) "The Prime Minister of Mongolia beginning his official visits to other countries starting from Japan indicates that Mongolia gives high priority to its relationship with Japan," said Japanese Ambassador to Mongolia Takenori Shimizu, during his meeting with Speaker of Parliament M.Enkhbold on October 3, 2016. Ambassador Shimizu congratulated Speaker Enkhbold and his party for their success in the general election and said that he hopes that the new Speaker will focus on further developing the inter-parliamentary relationship between the two nations. He stated "I think many works have been done to develop and expand the bilateral cooperation up to today. For example, I am pleased to say that many projects such as the Khushig Valley International Airport, hospital building under the Health Sciences University of Mongolia, as well as the Japanese scholarship for 1,000 engineering students are being successfully implemented." Furthermore, the Ambassador talked about the medium-term programme to develop the Mongolia-Japan strategic partnership between 2017 and 2021, and proceedings to take place to commemorate the 45th anniversary of establishment of diplomatic relations between the two countries. Speaker Enkhbold expressed his appreciation for the meeting with the Ambassador and noted that the role of the ambassadors of the two countries is crucial in expanding bilateral relations. The Speaker stated: "Mongolian-Japanese relations are developing rapidly and high-level visits between the two countries are becoming regular. Prime Minister Shinzo Abe visited our country last July. Mongolian Minister of Foreign Relations Ts.Munkh-Orgil visited Japan on September 27-28. Soon Prime Minister J.Edenebat will visit Japan. Parliament will emphasise and give its full support on the issue of establishing a medium-term programme on the development on the Mongolia-Japan strategic partnership between 2017-2021." During the meeting, the parties discussed the Government of Mongolia, cooperation with the IMF, Thermal Power Plan V and other projects and issues. Ulaanbaatar, October 4 (MONTSAME) Vice Speaker of Mongolian Parliament Ts.Nyamdorj received representatives of the Chamber of Deputies of Italy, headed by Mr Guido Galperti at the State House on October 4. The vice speaker introduced to the guests the new head of Mongolia-Italy friendship group in the State Great Khural (Parliament) A.Undraa. He also emphasized the important role of the Italian embassy, opened recently in Ulaanbaatar, in boosting bilateral ties and wished the delegates to attach more focus to promoting cooperation in agriculture, light industry, arts and culture. Mr Galperti thanked Mr Nyamdorj for his time and congratulated his party for the absolute victory in the 2016 parliamentary elections. He underlined 2016 was a remarkable year for the Mongolia-Italy relations, having visits of President of the House of Senates Pietro Grasso and Vice President of the Chamber of Deputies to Mongolia for the 11th ASEM Summit, Mongolia hosted with a success. The Embassy of the Republic of Italy opened in July as well, cited head of the delegation and added the opening of the embassy represented a considerable progress in diplomatic relations. The dignitaries touched upon and exchanged opinions on potentials they sides master to forward bilateral cooperation in agriobusiness, light industry, arts and culture, and energy through attracting more investment and favoring legal environment for businesses. Present at the meeting were, member of the Mongolia-Italy friendship group N.Oyundari, Secretary General of the Parliament Secretariat Ts.Tsolmon, acting director of the foreign relations division Sh.Narantuya, director of the Europe Department of the Ministry of Foreign Affairs M.Tsengeg. Ulaanbaatar, October 4 (MONTSAME) Chairman of the State Great Khural (Parliament) M.Enkhbold welcomed on Monday Ambassador of Turkey Murat Karagoz at the State House in regard to his pending return to home upon completion of his diplomatic mission. The Speaker expressed his high recognition of the Ambassador's contribution to boosting Mongolia-Turkey ties during his time in the office. He noted the cabinet and parliament have been formed with new composition and have defined the programs and priorities of action for the coming four years. The comprehensive partnership with the Republic of Turkey will play a certain role for the Mongolian government to achieve its goals, said the Speaker. Speaker M.Enkhbold said Mongolia is interested in continue the TIKA-assisted and other projects in the frames of the governmental non-refundable aid. The Ambassador of Turkey, Mr Karagoz thanked the Speaker for his time and conveyed the greetings from İsmail Kahraman, the Speaker of the Turkish Grand National Assembly. In mentioning Mongolia and Turkey have long ties having rooted in the ancient times, the Ambassador expressed a wish to upgrade the enduring successful comprehensive partnership to a strategic one. Mongolia and Turkey has signed over a hundred cooperation documents since 1990, said Mr Karagoz and noted the cooperation in defense and education has been progressing. It is important now to enhance cooperation in trade and economy, he said. In regard to the economic difficulties Mongolia is undergoing at this time, the Ambassador mentioned that Turkey, which economy now ranks 6th in Europe and 17th in the world, overcame same obstacles in its economic path. In the past years, the Republic of Turkey implemented Stand-By Arrangement 19 times benefitting some USD 50 billion of loan. By 2016, Turkey repaid all its debt to IMF and has reached the stage where it can be one of the lenders to the Fund, Mr Karagoz said. "We will be happy to share these good practices with Mongolia", he noted. At the end of the meeting, Speaker M.Enkhbold wished success in the Ambassador's future endeavours. October 4 (MONTSAME) Minister counselor of the Embassy of the DPRK in Ulaanbaatar, Mr Chwe Hyo Sen attended today the MONTSANE news agency to extend gratitude to Mongolian government and nongovernmental organizations for arranging a campaign to help North Korean people affected by a natural disaster. The news agency pledges to promote activities of those organizations in support of their charity campaign. Late August of this year, the northern part of North Korea was hit by strongest storm ever seen in last 70 years which brought heavy losses and damages to locals. The North Korean Embassy reports that 138 people have died and 400 people went missing. A total of 18 thousand buildings were destroyed leaving about 69 thousand people homeless. The Embassy of the DPRK stresses that DPRK did not and will not forget heartfelt support and assistance of the fraternal Mongolian people who has always extended helping hands in hard times of Korean war and natural disasters. Ulaanbaatar, October 4 (MONTSAME) Prime Minister J.Erdenebat received today Ambassador of Hungary Akos Madari. The head of government said the Mongolian government is interested in expand the rooms for bilateral relations with cooperation in the areas of economy, education, culture and science. The visits of the Hungarian President and the Prime Minister to Mongolia within a past year, and the re-opening of the Hungarian Embassy in Ulaanbaatar indicates a great advancement in the ties of two countries, noted the Premier. Mr Erdenebat suggested there are plenty of opportunities of cooperation, such as establishing joint factories in line with European standards in Mongolia, and commercializing their products on the giant markets of China and Russia. A hundred Mongolians enroll in the Hungarian universities every year with the government scholarships. The Ambassador informed that the number of students will be increased up to 200 from 2017. Ulaanbaatar, October 4 (MONTSAME) Opening ceremony was held for the Mongolian "Ireedui" (Future in Mongolian) school on October in Antwerp, Belgium. Ambassador of Mongolia to the Kingdom of Belgium Kh.Davaadorj addressed the event where he highlighted that inheriting the mother language, culture and traditions to the younger generations is an essential policy of the Mongolian state. In view of this, the government has developed targeted "World Mongolians Program" and the Promoting Mongolia Overseas Program, he said. He handed over Mongolian language and Mathematics text books, donated by the Association of Mongolians Overseas NGO and Save The Children of Japan, to school director E.Nergui. So far, 18 Mongolian children have enrolled in Ireedui, the second Mongolian school in Belgium. Leaders of the school are preparing to open a branch school in Ostend. October 4 (news.mn) Mongolia will mark the birthday of Chinggis Khaan, founder of the largest land empire in world history, on 31st of October. The birthday has been celebrated at a national level since 2012, when the Mongolian Parliament decided that the first day of winter, according to the lunar calendar, will be marked every year as the country's Day of Pride. On this day, special ceremonies are organized across Mongolia. Wreaths are laid at the giant Genghis Khaan monument and people who have performed service to the nation are awarded with the Order of Chinggis Khaan at Ikh Tenger, the presidential residence. Mongolians will have two holidays this month; first the local election on the 19th and then Chinggis Khaan's birthday on 31st. ULAANBAATAAR, Mongolia, October 3 (National Catholic Register) — A rare flower has bloomed in the cold, empty deserts through which once thundered the marauding hordes of Genghis Khan. Bishop Wenceslao Selga Padilla, apostolic prefect of Mongolia, spoke to the Register about his amazing success toiling in the Lord's vineyards of Central Asia for 24 years. He originally came with two others missionaries, Fathers Gilbert Sales and Robert Goessens, to Mongolia on July 10, 1992. Bishop Padilla, a native of the Philippines, belongs to the CICM Missionaries (Latin: Congregatio Immaculati Cordis Mariae, or the Congregation of the Immaculate Heart of Mary). This men's missionary religious congregation was established in 1862 by the Belgian priest Father Theophiel Verbist (1823-1868) in Scheut, Anderlecht, a suburb of Brussels. "This is really the face of the universal Church that is helping to build the kingdom of God in Mongolia. Foreign missionaries demonstrate a mosaic of races, colors and languages," the bishop said. "The Catholic community in Mongolia grows by about 20 new souls every year," Bishop Padilla said. When the missionaries arrived in Mongolia, "There were basically no native Catholics, but the people were searching," said Bishop Padilla. The spiritual emptiness to which the bishop referred is a result of nearly a century of brutally enforced Soviet secularism that was antithetical to religion. "The people continue to have an implicit desire for God. They are starting to feel a curiosity towards believers," Bishop Padilla explained. "To those who ask for information about us, we say: 'Come, and you will see.' Those who wish to become a Christian begin a catechumenal path that lasts two years." But the extraordinary success at converting the Mongolians to Christ's Church isn't the only reason for the local community to celebrate. "Father Joseph is a fine man, very talented," said the bishop, "a humble and gentle person. He's polite and respectful. He's a man of service ― always alert to serve, to whomever and wherever [is required of him.]" Bishop Padilla spoke of the new priest's family, too. "Catholicism/Christianity in Mongolia was new when we arrived. The people whom we met were curious as to who we were and what we do. We invited people to be free in meeting with us and joining in our activities, especially our liturgies. Father Joseph's two elder sisters were among these curious people. [He was 6 years old at the time.] He started attending Mass with his sisters. After a year of preparation/doctrine classes, he and his sisters were baptized. When Joseph entered university [where he studied] biotechnology, he stayed with our CICM fathers at the Sts. Peter and Paul parish in Seoul, Korea. It was there he became attracted to the priesthood. After his graduation, he enrolled at the seminary of Daejeon, Korea. After seven years of formation, he was ordained deacon. After more than a year as a deacon, he was ordained a presbyter on Aug. 28." In addition to Father Joseph, the Mongolian community is looking forward to an additional ordination of a seminarian who is in his fourth year of studies. If all goes to plan, he'll be ordained in three years. Another Catholic Mongolian has just entered the minor seminary, as well. "Some days before Father Joseph's ordination, a big photo of Joseph was placed at the cathedral's front wall. There were some kids playing in front of the church. One of them quipped, 'He's someone who just died!' Hearing this, I took it as a lead idea for my homily during the ordination Mass: Christ's command that we must deny ourselves and take up our crosses daily and follow him (Luke 9:23) jibed perfectly to the child's comment. Being ordained is dying to Christ, isn't it?" As Bishop Padilla remarked of the ordination, "I was caught in amazement/bewilderment. I see it as God's benevolent visitation to his people. He has again blest and gifted his people, the Mongolian nation." October 4 (gogo.mn) Gumuda concept store with the aim to collect all products of Mongolian designers at one spot, has released their fall lookbook, shot by Urlan studio. The lookbook gives us a different variety of looks reflecting Mongolian pattern. The collection includes jackets, coats, pants, shoes, accessories and bags from Deer brand, OGO, Urangooider Organic Clothing, EZA fashion, Mode, Agaar, Choice shoes, E.F.D, Nandin, Zazaa art, Pipo jewelery, Zolboo accessories, GAMI, Tuko Tailor, White comma, Nomt and Monalun. The new offerings are all available at the stores. The clothes that you liked the most may not have perfect size for your body. However you can order your size and your order will be ready within a day or up to 10 days. Ulaanbaatar, October 4 (MONTSAME) Beauties from 60 countries have challenged their talents in anticipation of the finale of Face of Beauty International (FOBI) 2016. The finale will take place on October 8 at Buyant-Ukhaa Sports Complex. Contestants from Mongolia, Kazakhstan, China, Spain and Portugal became the top five in the Miss Talent category. Their performances will be staged once again at the finale. This year's FOBI has chosen "Let's Save Mazaalai" as its motto, which is, as described by the organizers, raising awareness of the endangered bear species and making more tangible contributions to their conservation. Ten questions will be given to the finalists about the Mongolian Gobi bear, and the answers to which will be taken into consideration of the judging. As the special guest, the Human Barbie of Ukraine is honoring the audience with her presence. October 4 (news.mn) The 54th season of the State Opera and Ballet will open on 8-9th of October with the ballet 'Giselle' under the baton of Stefano Salvatore, conductor of "La Scala" Milan. This season the theatre will be working closely with artists from Asia, Europe and America. The new season will continue on 15-16th of October with Bizet's famous opera 'Carmen'. Over the last month, the State Opera and Ballet has been on tour; a total of 44 Mongolian artists gave four performances of 'Carmen' in South Korea. The Mongolian State Opera and Ballet plans to give more than 80 performances during the 54th season as well as an additional 30 performances in partnership with other companies and artists. This year marks the 70th anniversary of the creation of the Theatre's professional choir. As part of the anniversary, a special programme for children is being prepared which will include some interesting performances. October 4 (news.mn) 'Troubled Sun' is a new historic play, based on life of Mongolia's most famous writer and poet D.Natsagdorj and will be presented at the National Academic Drama Theatre next month. D.Natsagdorj (1906-37), whose statue symbolically replaced that of V.I.Lenin outside the 'Ulaanbaatar' hotel is best known for his poem 'My Homeland' ('minii nutag'), was one of the founders of modern Mongolian literature. He is also well known for his play, the 'Three Sad Hills', recently performed at Naadam. 'Troubled Sun' was written by the famous playwright Sh.Gurbazar and is produced by Ch.Tuvshin. October 4 (gogo.mn) Mongolian Arts Council in cooperation with the Embassy of France, with support from the Embassy of South Korea, Goethe Institute and Taiwan Trade and Economic Representative Office in Ulaanbaatar is organizing the 8th annual "Ulaanbaatar" international film festival on Oct 11-14 with the aim to increase the international cooperation of film sector and to support the film sector development by showing the best arthouse films of the world to the Mongolian audience. The festival will screen 10 arthouse films of England, Afghanistan, Germany, France, Poland, South Korea and Taiwan, competed at Cannes and Berlin international film festivals. "Ulaanbaatar" international film festival will open with the film, Zud directed by the Marta Minorowicz, on Oct 11 at 7PM at Tengis cinema. Tickets for films are available at the ticket office of Tengis cinema at MNT 3000. 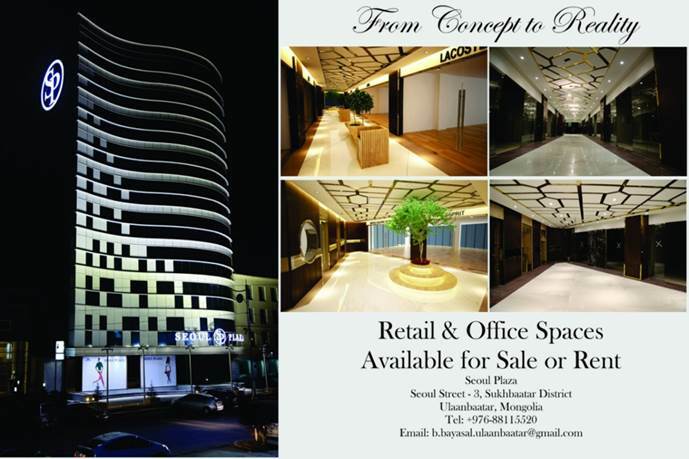 For more info, please visit at www.facebook.com/UBIFF.